Many of her writings including “Lihaaf” and “Angarey”, were banned in South Asia due to their feminist and reformist point of views. Her stories have now become classics for her female protagonists depict the real emotions and the real world. Ismat Chughtai was always known for her outspoken views on gender equality and the plight of women in the society. It’s the 107th birth anniversary of acclaimed Urdu writer Ismat Chughtai, and Google has dedicated a doodle to her to mark the day. 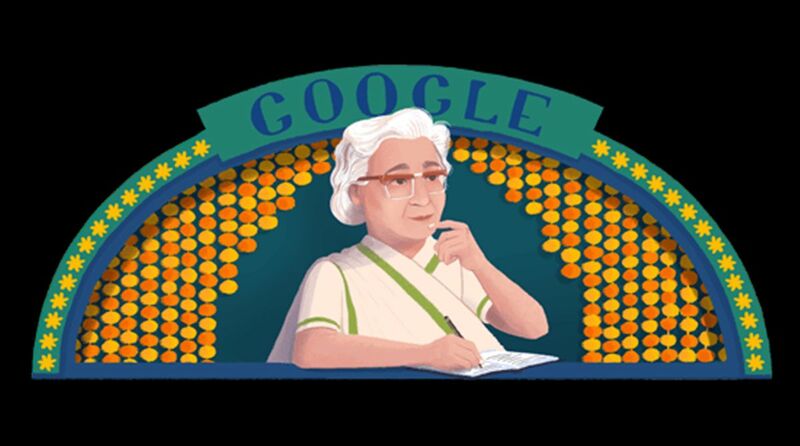 “Today’s Doodle celebrates Ismat Chughtai, the Indian author who championed free speech, social liberation, and gender equality through her writing,” Google wrote in a blog post explaining the doodle. There is a confusion about the birth year of Ismat Chughtai. While most published reports cite August 21, 1915 as her date and year of birth, she was born on August 21, 1911 according to Chughtai’s family, the Google post specifies. She was the ninth of her parents’ 10 children. Often described as outspoken and applauded for writing about real female characters, Chughtai was awarded Padma Shri by the Government of India in 1976. Her most known short story “Lihaaf”, was ahead of its times. The story is told through the point of view of a small girl who lives with Begum Jan, wife of a wealthy Nawab. Being a neglected wife, Begum Jan finds comfort with her masseuse Rabbo. The short story generated quite an uproar and Ismat Chughtai was forced to defend herself in court, the details of which she later describes in her memoir, “Kaghazi Hai Pairahan“. Many of her writings including “Lihaaf” and “Angarey” were banned in South Asia due to their feminist and reformist point of views. Her stories have now become classics for her female protagonists depict the real emotions and the real world. Her stories were translated to many languages, bringing in a renewed interest in Urdu literature. Later in life, Ismat Chughtai moved to Mumbai and became involved in films as a screenwriter and filmmaker. Her films were critically acclaimed and she co-founded a production company with her husband, Filmina. Ismat Chughtai was a liberal Muslim and she would say she came from a family of Hindus, Muslims and Christians who lived together in peace. Brave, unafraid and courageous — these are some of the words which can be used to describe Chughtai. A feminist, at a time when probably she herself did not know the meaning of this word, Chughtai was always known for her outspoken views on gender equality and the plight of women in the society. She was always ahead of her times and most of her stories like Chui-Mui are relevant even today. Her stories form part of courses of many universities.